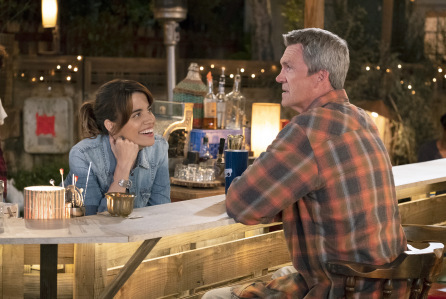 The one show NBC had to offer in its half day session at the TV Critics Association winter press tour this week was “Abby’s,” a multi-camera sitcom about a woman who opens a neighborhood bar in her backyard, from Michael Schur and Josh Malmuth that stars Natalie Morales. The notion of sitcom set in a bar brought up notions of that famous TV show where everyone knows your name. “It’s a completely natural question that’s going to come up, I suspect, over and over,” says Flynn, who comes to the show after the end of “The Middle.” Only the setting is similar, he says, and it’s been 25 years since it’s been on. “Except it occurs to everyone,” he says. “On most show nights somebody would come up to me and say, ‘Just so you know, there is a skunk 10 feet that way,’” Malmuth says. “Abby’s” premieres March 28 at 9:30 p.m. on NBC.